Amazon is again putting its financial might behind the Seattle business community’s main political action committee, a sign that it intends to influence the wide-open election this fall for seats on the city council of its hometown. Amazon’s $200,000 contribution to the Seattle Metropolitan Chamber of Commerce’s Civic Alliance for a Sound Economy (CASE) comes amid a tumultuous and changing relationship between the company and the city where it has some 45,000 employees. The contribution was made on March 7 and disclosed Friday as part of CASE’s regular monthly report to the Seattle Ethics and Elections Commission. CASE had more than $485,000 in its account at the end of March. “They’re the city’s largest private employer and like all of CASE’s members they’re really focused on supporting candidates who are accountable, and back-to-basics governing,” said CASE executive director Markham McIntyre. Amazon has been a contributor to CASE since 2013, the first year the organization became closely involved in city elections, McIntyre said. The company gave the committee $365,000 during the 2017 election cycle. CASE poured much of that money into the successful mayoral campaign of Jenny Durkan. CASE has yet to make endorsements for the 2019 election. McIntyre said the group is waiting until the filing deadline, May 17. More than 50 people have so far declared their candidacy for the seven open council district seats. Only three incumbents are running for reelection. Amazon, like other CASE members and contributors, will participate in the endorsement process, McIntyre said. Businesses and other contributors can give no more than $250 directly to council candidates that accept the city’s democracy vouchers, and no more than $500 to candidates who don’t accept the vouchers. There is no such limit on contributions by so-called independent expenditure committees, such as last year’s No Tax On Jobs committee, which campaigned against the city’s short-lived head tax and raised $25,000 from Amazon. That campaign was in response to a proposed per-employee tax the city council passed to raise money for housing and homeless services. It was the point at which Amazon’s discontent with city leaders spilled out into the open. 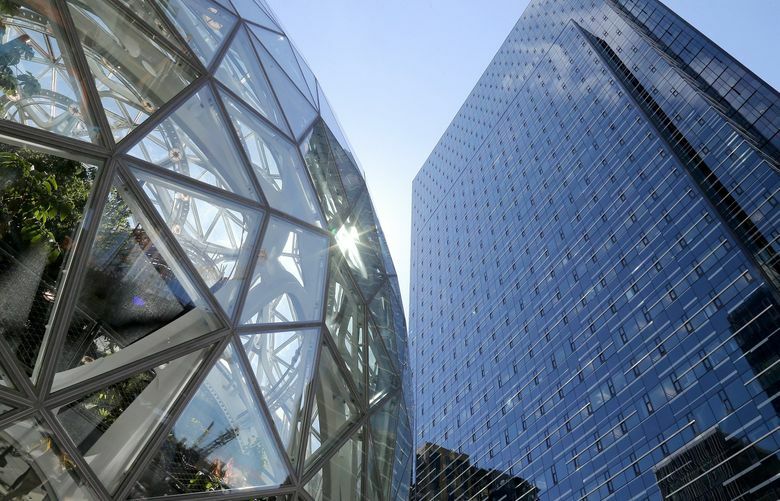 Amazon threatened to pause construction on a new office tower and to sublease another tower it planned on occupying if the city went ahead with the tax. The city council ultimately reversed itself. Amazon confirmed earlier this year it is subleasing Rainier Square tower anyway. It is also moving a division with several thousand employees from Seattle to Bellevue over the coming four years. And it is building what it calls a second headquarters in Virginia. At the same time, the company continues to grow in Seattle, with nearly 10,800 job openings in the city and 2 million square feet of new office space under construction. McIntyre said CASE members — and Seattle voters at large, according to its polling data — are first and foremost concerned with the ongoing homelessness crisis. “It’s not just about raising more revenue,” he said, suggesting Seattle should focus on programs that are already working here and elsewhere. Other top issues are transportation, and housing and land-use policy, McIntyre said.